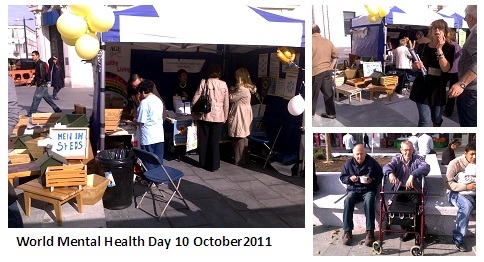 On 10th Oct. 2011 the Men in Sheds Greenwich joined in the celebration of World Mental Health Day in Woolwich Town. Sharing a stand with Age Concern Greenwich Men in Sheds displayed the crafts that were made by the Men in Sheds. Some orders were also made on that day as we promoted the project, invited more people to participate in the activities at the shed. It was a successful event, thanks to all who turned up and also those who worked behind the scene. This entry was posted on Wednesday, October 12th, 2011 at 4:38 pm and is filed under Age Concern, Community Matters, Getting Involved, Health Matters. You can follow any responses to this entry through the RSS 2.0 feed. Both comments and pings are currently closed. Love the site Leonard, well done and well done everyone who is involved in the project. Long may it last and grow. Thanks for your supportive comment. We will be doing some maintenance on the site shortly and may go offline temporarily. But we will be back online as soon as possible. Glo, thank you for the comment and encouragement. Please tell your friends and supporters about us and also those who may want to join us at our Eltham shed.